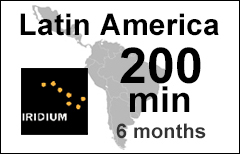 The Latin America 200-min voucher refills your existing Iridium Latin America account with Sattrans. Geographic restrictions. Iridium Latin America plan subscribers can place outbound calls and send text messages ONLY from land of countries and territories in South and Central America, EXCLUDING the Caribbean region, including 12 nautical miles into coastal waters. It WILL NOT work for either outbound or inbound calls anywhere else. Maximum Account Validity. The maximum validity of a Latin America account cannot exceed 6 months from the date of the most recent voucher reload. Maximum Age Limit. The Maximum Age Limit of minutes in a LA-200 voucher is 3 years.